Picture your high school basketball court. Conference and sectional titles from years ago hang proudly, even if a little discolored from too many years in the gym. The glossy floor mirrors bright lights that are ready to radiate heat over each passionate player and hysterical fan. The band breathes life into every note; the cheerleaders flail limbs and scream words of motivation. The first players run out and the next few stumble along. The last few impassionately trudge in. The coaches watch with disapproval and eventually just leave. The competition has already won. Where has the motivation gone? What happened? On a sports team, personal triumphs are also team wins. Team wins are also celebrations for the entire community. Our sneakers grew holes and our jersey styles phased out years ago. We graduated from participating athletically from the court yet these competitive situations will never really leave our lives. Imagine your business is that losing team. Is it? Gartner predicts that 80% of social business efforts will not achieve successful results because of poor leadership and too much focus on technology in 2015. Businesses are quick to implement enterprise social networks, yet failure often results more quickly than the decision to buy the software in the first place. Why? 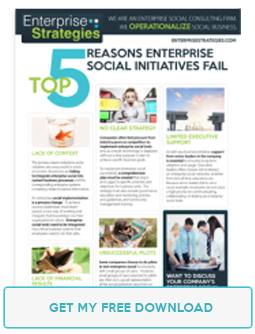 Enterprise Strategies Founder Andy Jankowski most recently led a webinar concerning this phenomenon, focusing on the top five reasons why enterprise social networks fail. But what are work objects and what kind of barriers exist? “Work objects are when two or more people come together to work in the context of fill-in-the-blank” says Andy. Apply this to a team and it becomes clear. You don’t stumble onto the court early mornings to socialize with teammates. Yet the bond between teammates exists because of the hours spent communicating and striving toward a common goal, accomplishing personal wins along the way. Socialization comes in the form of good and practiced communication. Employees within a company function similarly. Work friendships will arise, yet the unity between coworkers is strengthened by the common work objects within the corporation. The communication between professional teammates is essential to avoid failure. 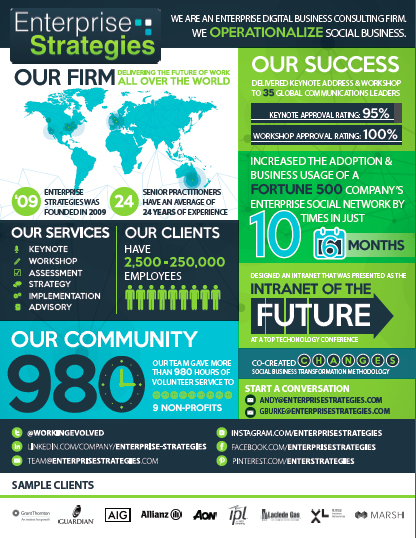 Enterprise social networks are designed for the socialization experience coworkers, more simply, humans, desire. Executives readily buy into the benefits of implementing one after realizing the social advances it can yield; however, without proper execution, enterprise social networks can quickly fail. In the opening game example the environment was equipped with enough tools for the team to win: a peppy band, limber cheerleaders, a pristine court, and the enthusiastic fans anxious for a win. What went wrong? Let’s imagine it is your team. Your coaches recruit you to play, yet when you and your eager teammates show up in your shiny matching shoes for practice, the coaches are nowhere to be found. You and your teammates try to run practice by yourselves but end up leaving early unmotivated and disengaged. No team can achieve greatness without the support of a coach, so how can employees be expected to practice using an enterprise social network without the support of their executives recruiting them to do so? A successful enterprise social network involves executives setting examples through their personal involvement with social, instead of simply funding it. 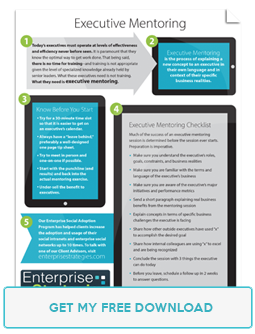 Andy lists four simple steps to take when engaging executives to participate. 1. Conduct a workshop. In the workshop focus on the Ws of social collaboration. What social collaboration is, who will be using it, which companies (or competitors) are using it, and even what terminology to use. 2. Executive mentor with peers. It is important to equip executives with skills necessary to socially collaborate, even if it means teaching them to be digital natives. 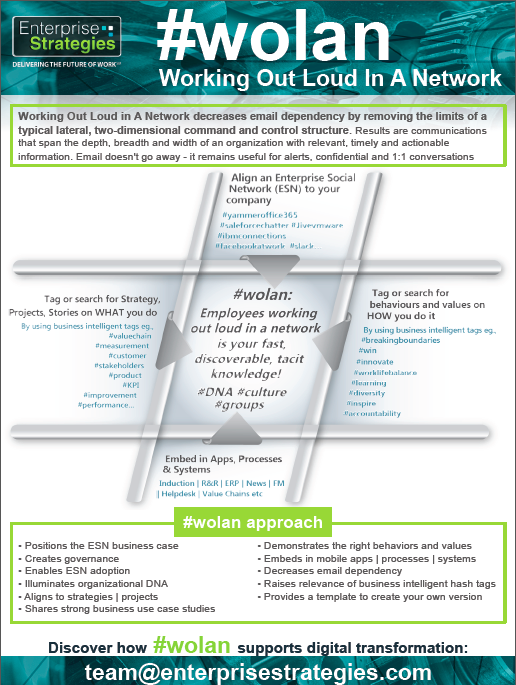 Address goals for a network in relation to business complexities they understand and enterprise social can solve. 3. Schedule an event. Lack of time is a common problem for executives and general employees alike. If an event to learn and incorporate the education of an enterprise social network is scheduled, it can be easily accomplished. 4. Establish a Community Manager program. For those who are particularly active on the network, creating the position of an ambassador allows someone to connect the dots between employees and also bring executives into the digital conversation. Each practice brings a new play, strategy, or drill. Your teammates participate but without the enlightenment of the coaching staff, the purpose is never conveyed and now motivation is fading. Positions are shifted around and no explanation is given, let alone talk of competitors or games to come. Why is change happening and what is its purpose? In the evolution of technologies, many took time to assimilate into existing business applications. Enterprise social networks can lead to a rough adaptation if the context in which it exist is unclear. The technology is easily purchased, yet difficult to make work. Instead of simple immersion, the evolution of each led to standalone business and social silos. For employees to collaborate socially, it must be understood that business and social can intersect. To counteract this negative progression, it is important to introduce the concept of social collaboration in context of real business problems. Instead of introducing it as another process, make it part of your business process. You spend practice challenging your body to its athletic potential. Drill after drill is run and the gear is ready to wear. The first game only brings confusion and eventual loss when the players take the court blindly and stumble their way through without a clear strategy. Without the prior coordination and attachment to a plan, the game results in a failure. Just like MasterCard’s famous Priceless campaign, some things in life cannot be monetarily quantified. Yes the instruments in the pep band came with a price, the cheerleader’s sparkling pom-poms were fundraised with wrapping paper, and every proud mother spent a pretty penny to screen-print their son’s numbers across their backs. Yet the price of a win–or a loss–is something each spectator, coach, or teammate will quantify differently. A set number does not exist. 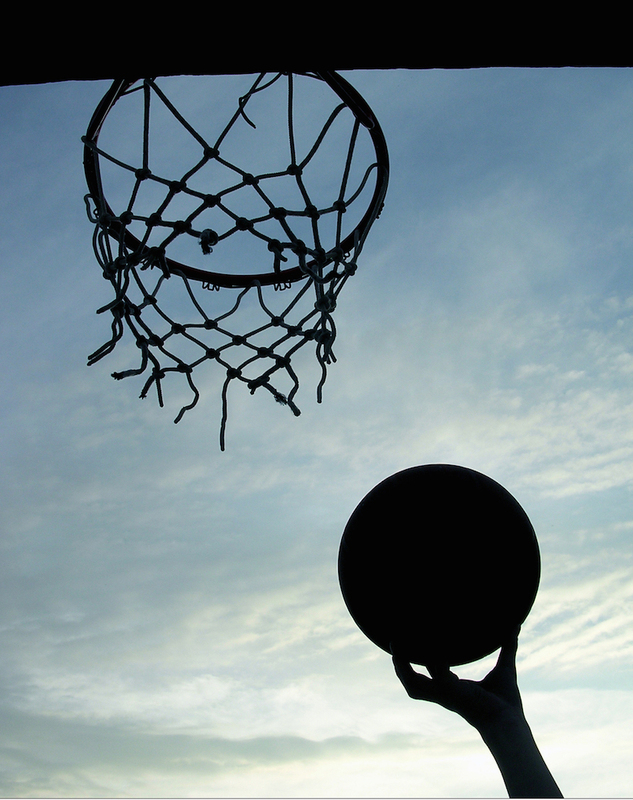 The success of a businesses–or athletic team–can center around one simple core: money. Tools like enterprise social networks have created the necessity for a more analytical focus, but especially the demand for quantitative results. With the focus of metrics and money, it is easy to get lost in the pursuit of business goals surrounding the improvement of ordinary business objectives. Instead of predicting and depending on the financial results of social collaboration, focus on the small picture. Give reports focusing on the case-by-case basis of improvement in existing business processes. Place financial results in proper perspective. When email first came out, was it able to yield provable financial results? When it comes to bettering communication, don’t try to quantify the unquantifiable. The sprints are exhausting so you just start walking. Why put effort into practice when you know if the first game fails you won’t have to play anymore? The coaches tell the team that they are simply participating in a trial– if you win, you will continue, but if you lose its all over. The first game you lose and in the post-game meeting, your coaches disband the entire team. It was just a test and it didn’t work they say and you really don’t care. In a business, the failure of an enterprise social network can often result in an unsuccessful pilot trial. Pilots can be thought of as an option; if it works and the effort is present it will stay, but if it doesn’t then it is on to the next thing. Andy believes that proper implementation of an enterprise social network doesn’t have to involve a pilot. In fact, he warns against one. Pilots that affect one small part of the company cannot project results for the entire company’s business processes. They also exist in addition to an employee’s regular schedule of work projects and obligations, appearing as an extra chore which isn’t given the motivation it deserves. If you have to do a pilot, instead of calling it a pilot, think of it as a phased rollout leading to a global communication campaign. For executive buy-in, gauge the success of the pilot on a positive end-user experience using enterprise social tools. Do not judge global acceptance upon a small group of users. While we all leave our athletic glory days behind us, successes still happen throughout the rest of our lives. Just like in the game, the implementation of enterprise social networks hold the great chance of a failure– or a company win. Our coaches turn into executives and our teammates our coworkers, yet the same proper strategic communication is necessary in today’s increasingly collaborative workforce. Whether it is the rollout of your enterprise social network’s campaign or even convincing your executives of its worth, the priceless triumphs require the coaching and teamwork of a company’s key players. Passionate about writing and journalism, Savannah's previous pieces have focused on the millennial experience in higher education and the workforce. She enjoys learning about social media and the impact of digital trends on attracting and retaining millennial talent. When not crafting articles, she enjoys trying new restaurants, traveling, and competing in triathlons.